Encore S Gas Dispenser | CSESCO INC.
With the Encore S fuel dispenser, your hardest worker is on your forecourt. Every day, Encore S fuel dispensing systems deliver unparalleled reliability that has proven to incur 30% fewer service calls than the competition. And it offers you the lowest cost of ownership on gasoline dispensers, so you keep more profits in your pocket. Lowest maintenance cost. High return on investment. It’s no wonder most c-store operators choose Encore fuel dispensers. Not only is it designed to protect and track your profits, it also delivers a user-friendly fueling dispensing experience. 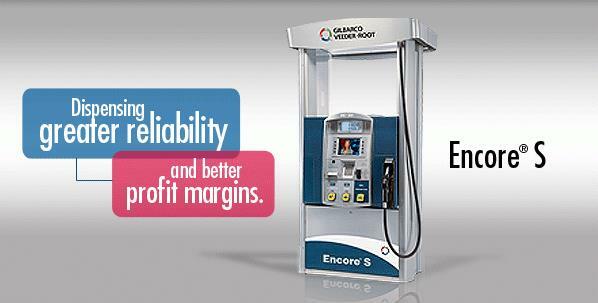 Experience the advantages of having an Encore S gasoline dispenser on your forecourt. Robust electronics platform creates “always-on” reliability and integrates seamlessly with any third-party POS or Passport. Meter accuracy results in operational savings. Flow optimization allows for incremental transactions by having dispensers open during peak hours of operation. Flow is controlled at the nozzle for maximized system performance. Multiple alternative fuel offerings drive traffic into your store by offering alternative fuel types at your site. Timeless design and Tedlargraphics enhance your brand image and look, creating a positive impression. Hydraulic layout/footprint eliminates the need to break concrete and replumb below grade, allowing for faster filter changes. And Encore can utilize existing pit boxes in retrofit sites. Wear-resistant surface area stays fresh longer to reduce the costly expense of rebranding. Modular approach to payment security future-proofs your system. By allowing for an expandable platform, the flexible design minimizes long-term expenses due to changing regulations. Enhanced dispenser security gives customers exactly what they pay for while fuel variance savings reduces theft.